Late one Saint Paddy’s Night past, amid all of the discarded cups and cans, the seashells filled with cigarette butts, and the other debris left behind by the revelers at Marty O’Brien’s Public House, Kevin McKee, my friend from Chicago whom I only see on Saint Patrick’s Day, was about to take his leave. Since we had had such a good time, as we always do, I made a suggestion. For McKee, like another jolly fellow from the north, comes around but once a year and, like that other jolly fellow’s annual visit, McKee’s marching with us has become a tradition – one that we have upheld every year of this century (except one). The uninitiated or the skeptical might ask why. Why fly from other cities and countries, take trains and boats from other states and boroughs for this old tradition of marching? Why are we so bound and determined to march on a beautiful day or in the driving snow? True, the parade is exclusionary and stodgy and conservative and martial. It may be out of touch with modern Irish culture. But the New York Saint Patrick’s Day Parade is an Irish-American institution older than the United States itself and a chance for the scattered members of the Irish diaspora to get together for one day in the center of the world. The New York Saint Patrick’s Day Parade is the granddady of all the other parades, the biggest civilian parade in the world. 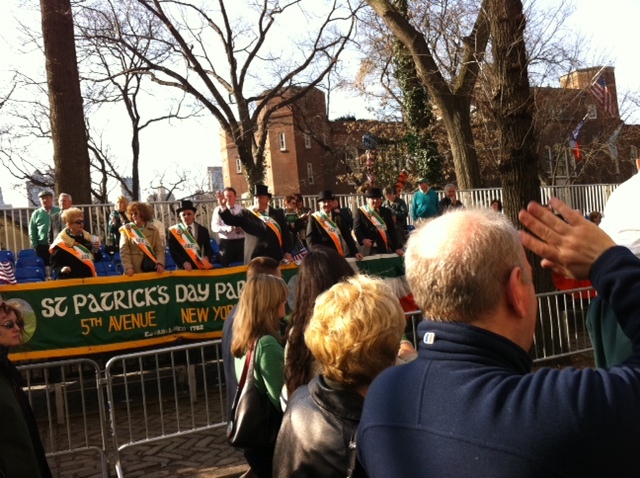 If you are going to be anywhere in the world on Saint Patrick’s Day, Fifth Avenue is the place to be.